The Mikulski hens. Photo by David Lewinski. “I was literally laughed at by City Council,” Wooten says of her efforts to get backyard poultry legalized in the City of Berkley. 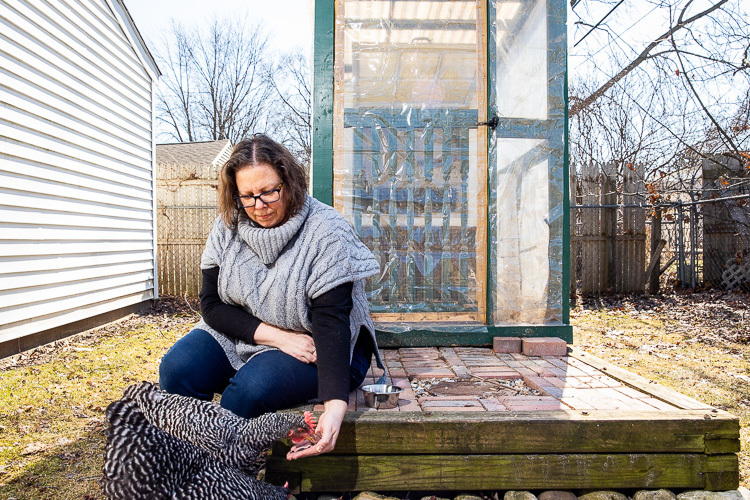 Wooten is part of an informal network of Metro Detroiters who have taken it upon themselves to push for city ordinances to allow residents to keep laying hens in suburban backyards. In the process, they’ve leaned on one another to help make their argument to city councils and other residents. They’ve also developed and shared best practices for implementing poultry ordinances in Metro Detroit cities. Courtney Wooten. Photo by David Lewinski. Their work has empowered citizen activists as young as twelve find their voice on an issue that’s important to them. 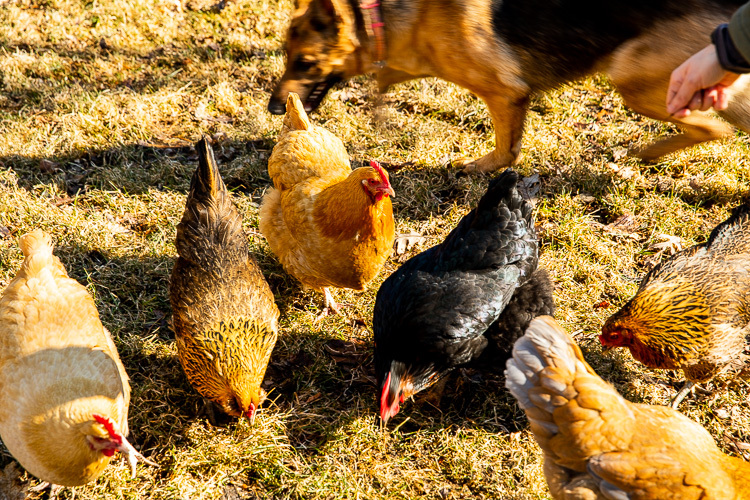 What’s emerged is a case study in small-scale civic action that--although it has certainly caused some arguments--seems to be connecting neighbors and creating a sense of community around backyard fowl. Wooten experienced her share of opposition, especially on social media. But when she brought members of the city government and others out to see her coop in Lathrup Village--where she had been living before moving to Berkley--the dynamic changed. “It wasn’t that everybody left super-excited about chickens, but very few people left that conversation still super-opposed to it,” she says. Wooten credits the change of hearts to the effect of being exposed to chickens first hand. ‘“People have this picture in their mind of a farm,” she says. “Which is a logical leap to make, but that’s not what this is.” Pictures of her own coop show an immaculate structure with beautifully striped Barred Rock hens. The Wooten hens. Photo by David Lewinski. Wooten also got help from a Hazel Park city councilperson Alissa Sullivan who--as a dog trainer and former veterinary technician--serves as an advocate for animal issues. Hazel Park has about five to 10 chicken keepers, the legacy of an ordinance that has been in place since the 1950s. Far from being a fad, today’s chicken-keepers continue a tradition that was started by the farmers and factory workers who first lived in Hazel Park after World War II. 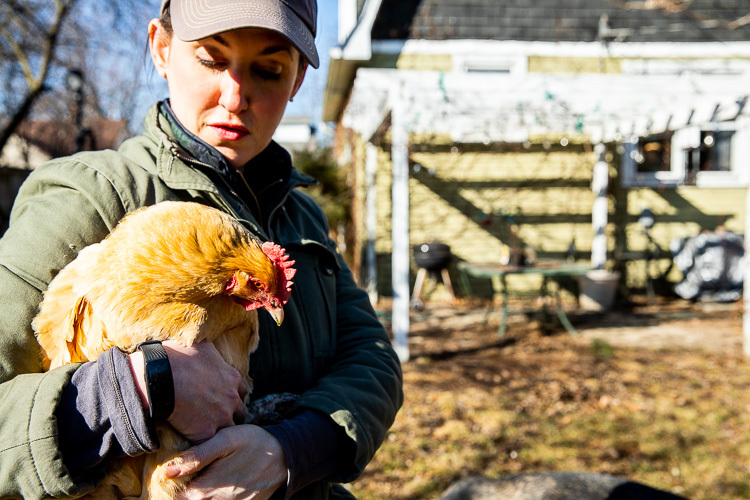 As a former chicken keeper herself, Sullivan has been able to go to city council meetings in Berkley, Huntington Woods, and Clawson and to serve as an educated advocate for chickens. “A lot of pushback we see is from people not knowing, not understanding or not having facts on things,” says Sullivan. By sharing Hazel Park’s story and bringing facts to bear on the issue, she has been able to help people like Wooten allay fears that are generally grounded in a lack of familiarity with chickens. Wooten says that although many people complained about Berkley’s potential ordinance online, few actually showed up to city council meetings to back up their position. Laura Mikulski of Ferndale compiled information on backyard poultry and ordinances on the website ferndalechickens.com, which is a result of her own years-long quest to get a poultry ordinance passed in her city. Although Ferndale had a policy allowing chickens, the space restrictions for keeping them away from other properties were so extreme that very few property owners could keep them in practice. In order to get a more accommodating ordinance passed, she spent years researching chicken behavior to address concerns around noise, cleanliness, odor, and rats. “People don’t know what a chicken sounds like,” she says, “and they don’t have a reference point.” So she made a chart to show how the noise from hens compared to other common sounds. According to one chart the noise of clucking hens at 2 feet is about 70 decibels, equivalent to the sound of a lawnmower heard from 100 feet away and somewhere just above the volume of a normal conversation. And most cities, including all those mentioned in this article, ban noisy roosters. Laura Mikulski. Photo by David Lewinski. With similar research, Mikulski was able to dispel worries about cleanliness and smell. Importantly, the ordinance that Ferndale eventually passed requires enclosed runs and coops. Mikulski was also able to show that the waste from three hens was less than that of a medium-size dog and moreover, it was compostable. Chickens, it seemed, didn’t actually attract rats, although unsecured feed could. By creating an ordinance that enforced proper coop construction, chickens would conceivably present no more of a risk than any other potential food source. And, in general, chicken owners don’t like to leave their coops unsecured because of the danger presented by predators. “After all that was done, no one really had much in the way of argument,” Mikulski says. Sullivan mentioned one other concern presented to her at meetings-- the fear chickens could carry salmonella. This can be a danger for those who come in direct contact with the birds. 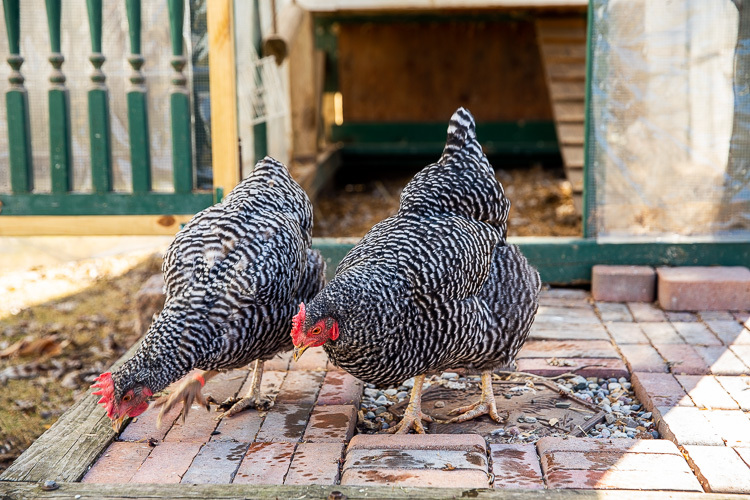 The CDC lists several common sense tips for handling chickens that include hand-washing and not bringing chickens indoors. Ferndale eventually passed its chicken ordinance in 2012, allowing for 3 hens, amending this to 6 in 2018, which Mikulski says is an optimal number that allows keepers to more easily introduce a couple of new birds so that single one isn’t hen-pecked too badly when old ones die and need to be replaced. Ferndale requires chicken keepers to pay 35 dollars for both registration of new chicken coops and yearly re-registration of existing ones. City inspectors make an annual check of the 25 or so coops in the city. Berkley charges 85 dollars per year and also has annual inspections. Hazel Park requires chicken-keepers to survey their immediate neighbors, submit a plan to the city and get a coop inspection. However, there is no charge for the permit there. Mikulski counsels persistence to those looking to get an ordinance passed in their own city. And she adds that far from being bad neighbors, chicken keepers can help anchor a neighborhood. Her neighbors excited to meet her first chickens: Dumptruck, Bossy, and Little Girl.